Had the advocates not intervened, and the judge not ruled, wild horses almost certainly would have been slaughtered in violation of federal law and policy. Moreover, if this episode represents a policy shift for the administration — if it is now the policy of the United States to actively help private parties sell their horses to slaughter — the American people surely deserve to have a fuller opportunity to debate the wisdom of that policy. No one sums up better what happened with America’s federally protected wild horses than Andrew Cohen over the past few weeks, in particular the horses sent to the slaughter auction in Fallon, Nevada this past weekend. It’s hard to believe or describe what just happened to hundreds of horses who were, until last week, roaming free in northern Nevada. Unwanted by members of a Native American tribe living near them, quietly delivered up by federal agents who wanted to make room for grazing livestock, unprotected by Obama Administration which says it is opposed to slaughter even as it enables it, the horses, more than 460 of them, were rounded up and shipped late last week to a public auction known for attracting “kill buyers” looking to fill slaughter plants in Canada and Mexico. I’m told that approximately 149 horses — unbranded and thus likely to be wild horses protected by federal law — were spared from slaughter on Saturday thanks to wild horse advocates, public interest lawyers, and a federal judge who late Friday night issued a restraining order because of the “serious questions” she had about the way the roundup was conceived and executed. 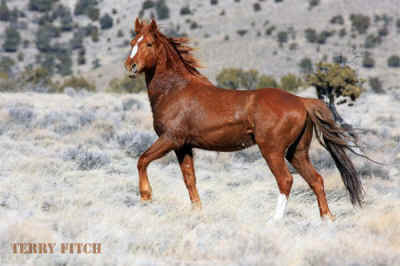 But approximately 316 other horses, branded and thus considered private property, found on federal or tribal lands or otherwise brought to auction by their legitimate owners, were sold at a public sale Saturday in Fallon, Nevada. The story of what happened to these horses is part of a broader story of the Obama Administration’s deliberate indifference to the nation’s wild herds and to the federal laws and policies designed both to protect and manage them. It is also a story that highlights the uneasy contradictions in the administration’s policy toward horse slaughter. Administration officials — like Agricultural Department Secretary Tom Vilsack, for example — have gone on the record saying they are opposed to slaughter. But it was the USDA’s Forest Service, in ways still not fully explained to the American people, that planned to facilitate the roundup of these horses (both the branded and unbranded ones) on behalf of the Paiute-Shoshone tribe — a roundup destined (as it did) to lead to slaughter for many of the horses. There is no law in America today that says a person can’t sell his horse to slaughter. Members of the tribe had a right to collect and sell their own horses. But many serious questions remain about what happened last week, most notably these two: How did it come to pass that hundreds of horses were rounded up and shipped off for sale in the days immediately following a public announcement by the Forest Service that it was postponing that very roundup? And why, a week later, has the Forest Service still failed or refused to explain precisely what happened to cause these horses to be rounded up before officials satisfied their reporting requirements under federal law?